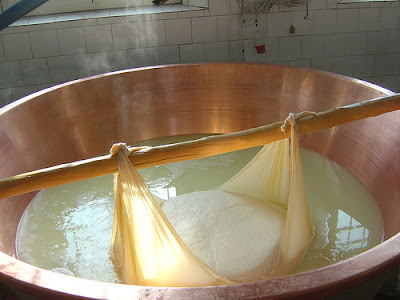 The third step involves some amount of heating or cooking the curds as well as a holding period during which they are left to sit in the vat while the effects of acidification, and cutting proceed. Timing is crucial. The time and temperature of cooking is adjusted according to the composition of the milk and nature of the curds. The smaller the particles, for example, the hotter they will get. Generally cheese making vats are hollow stainless steel “jackets”, allowing water to circulate inside and gently heat or cool the curds. If heated too quickly they can overcook and develop a hard outer skin, like trying to bake a cake with scrambled eggs. During heating the curds are stirred to prevent clumping. As the curds swish and sway they bump into each other which has a pressing effect, promoting moisture loss. The more heat and stirring, the more moisture loss, the harder and denser the resulting cheese. Curds intended to become softer, higher moisture, bloomy-rind cheeses, such as Camembert, will undergo relatively mild heating, a gradual cooling and resting period, with little or no stirring. Curds for harder cheeses are “cooked”, heated to higher temperatures and stirred more vigorously. When to stop cooking is critical to success. Cheese makers apply their savvy and intuition based on manual tests. Scooping out samples, squeezing them, rubbing the curds between their hands to get a feel for texture and consistency. Next they allow a portion to settle in their finger to see how much it sticks. This is called the “grip.” Both the “break” and the “grip” reflect the levels of acidity within the curds. An optional step at this stage is to drain some of the whey from the vat and replace it with water, as is done with Gouda. Known as washing the curds, this helps lower acidity and raise the lactose and moisture content. 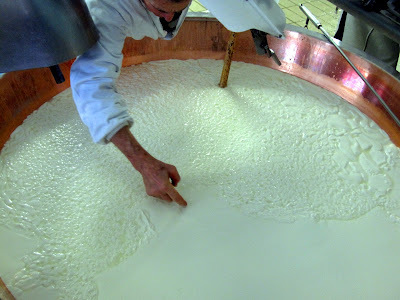 The cheese makers job at this point is to coordinate the firmness of the draining curds with their acid development and figure out exactly when they are ready to be removed from the vat to undergo the next step toward becoming cheese.